Currently 4299 students are enrolled in the MBA, BBA and BS programs. The MBA program consists of two years (4 semesters) and 18 months programs for IBA graduates, while the BBA and BS programs extend over four years (8 semesters). The distinguishing features of the IBA are the induction of students through a systematic, merit-based admission process, training in a demanding academic environment, supervised internships or attachment with industry and on time completion of study programs. Rigorous admission procedures, modern curricula, contemporary methods of instruction and stringent system of examinations at the IBA, give it a unique position among leading educational institutions in Pakistan. The IBA ensures that no student is deprived of education at the Institute due to financial constraints and to accomplish that ideology, every 3rd student at IBA is provided with some form of financial assistance. Scholarships, stipends and financial assistance are provided on the basis of need. 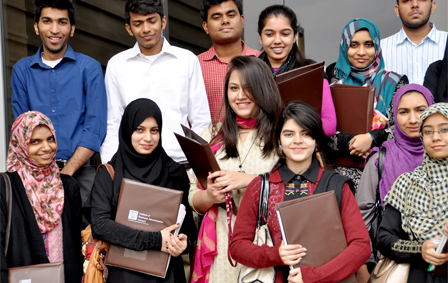 The National Talent Hunt and Sindh Talent Hunt programs aim at attracting and training underprivileged but meritorious students from the undeveloped districts of Pakistan to enter IBA. Students participate in a broad variety of activities ranging from volunteering for charity work and participating in athletic events to organizing conferences on a variety of business issues. A spirit of involvement is important because teamwork, leadership and being a responsible citizen are the foundations of the IBA experience.